As mentioned in previous blog posts, the moving team dedicated April to relocating a collection of large building stones. Here comes a step-by-step overview of the method we used for the move. To see the moving movie click here. First week we photographed the storage where the stones were located and at the same time we made room in a different storage facility. Second week we began the actual moving of the stones. Padding and strapping the stones on their pallets and lifting them out by crane. The crane job had to be finished before two o’clock every day, to avoid being in the way around rush hour. The stones were then dropped off at a nearby parking lot to be washed. First week the weather was sunny and the stones dried fast, but second week it rained and water vacuuming was needed to dry the stones. The lot had garages serving as an in between storage for stones not ready to be transported to the permanent storage. After the stones were washed, they were moved onto plastic pallets, some by crane, and then photographed for general documentation and to document damages that might occur during the move. 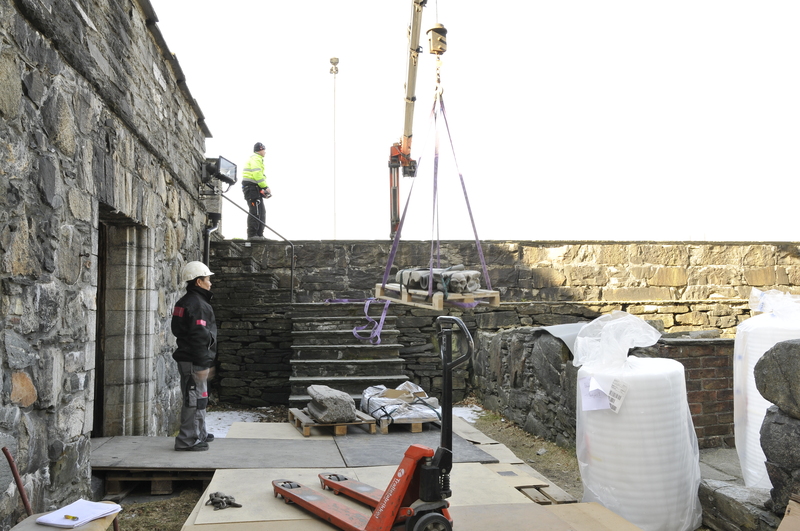 The dry stones would then again be padded and strapped to the pallets and moved to the permanent storage, where they will be placed. During the whole process we had to keep track of numbers on both stones and pallets to make sure that no information were lost. The moving took three weeks.